Make time to share life together, outside of holiday family get-togethers. Grandpa would take his granddaughter fishing, or with him on an errand or short road trip. Granddaddy listened with his granddaughters to episodes of a children’s radio show, Adventures in Odyssey, for hours as our family drove several hours to relocate in another state. Listening to grandchildren’s interests opens the door for discussions about character and ethics and consequences of choices we make. As a young teen, I enjoyed writing letters, especially to my Grandmother because she wrote back! My Mom would slip little notes of encouragement in my lunches or luggage. I’ve kept those letters and notes; they remind me that I was valuable in their eyes to spend time and stamps to write their thoughts to me. We have a recording of a conversation with Grandpa as he reflected on a Christmas he spent in Korea during the war. To hear his thoughts about the war and the transcending peace of knowing God’s Son during that time continues to encourage us stay grounded in the foundational truths of life. I have a recording of my Granddaddy’s testimony, given during a choir program at church when he was in his eighties. He died months before my first child was born. When she graduated from high school, we played that testimony of her Great Granddaddy, followed by testimonies and encouragement from her Granddaddy, Grandpa, and Dad. Take time to reflect on the heritage of faith or be the first to start this in your family. Children can discern at an early age if our words are backed by action. Living a life of integrity speaks volumes. Being humble and honest about our failures opens the opportunity to understand forgiveness and grace and starting again. I traveled with a sister in the Lord, a Grandmother, on a mission trip several years ago. As we were on the plane, she realized that she had been a believer in Jesus for 50 years! She made a point to share this reality with the young people as she spoke. She had personally known the Lord for 50 years, and He IS trustworthy, faithful, and her dearest friend. She didn’t just share with them what the Bible says, but she could testify that His Word is true. Powerful! I distinctly remember my Grandmother praying for me when I was 12 years old. I can still hear her sweet voice praying for me and my children and my grandchildren to all know and love the Lord. I was so surprised that she would pray for my children and grandchildren at a time when I was still a child! She went to heaven as I graduated from high school, never seeing the answers but trusting that God would answer her prayers. And yet there have been countless times through the years that I have seen the answers to those prayers! I am so grateful that she prayed for all of us, that I heard those prayers, and that God continues to answer them. As an empty nest parent of grown children and a caregiver of their grandparents, I am realizing even more the powerful influence that family members have on each other. A grandparent’s Influence can bring hope, encouragement, perspective and character training. Or without realizing it, their influence can by default instill apathy, self-centeredness or bitterness. 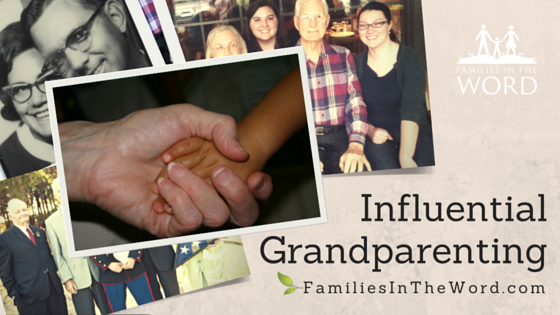 Grandparents have a God-given personal power of influence with their grandchildren and others. Ask God to show you what He wants you to share about Him with others; ask with the intent to do whatever He directs. How did your grandparents influence you? How do you use your influence in the lives of your family?